Last month Herbert and Catherine Schaible were charged with third degree murder in the faith healing death of their 8-month-old son, Brandon, who died from bacterial pneumonia and dehydration. As members of the First Century Gospel Church in Northern Philadelphia they had tried to heal the child by prayer instead of getting him medical care. The church teaches that “it is a definite sin to trust in medical help and pills,” and states that those who do not trust God for the healing of their bodies are not saved. The Schaibles are being held without bail pending a June 12 preliminary hearing, and their seven remaining children have been placed in foster care. One reason why there were taken into custody is that they were still on probation for the negligence death of another child. In December, 2010, they were convicted of involuntary manslaughter and child endangerment in the pneumonia death of their 2-year-old son, Kent. The lawyers who defended them in that trial — Bobby Hoof for Herbert Schaible, and Mythri Jayaraman for Catherine Shaible — are also defending them in the current case. For the Schaibles and others like them, however, there is no protection when faith and law collide. “For parents, there is no religious exemption, no absolute license that lets you do what you want in the name of religion,” Crampton said. 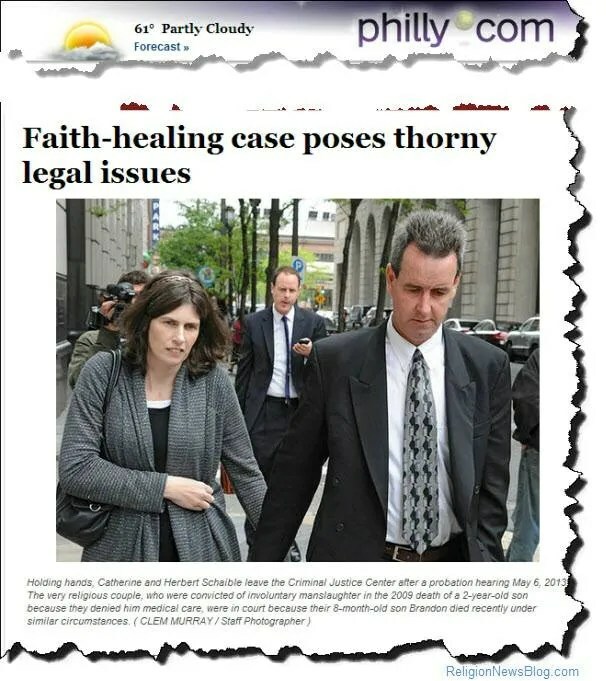 If it determined that their child died as the result of their reliance on faith healing instead of providing medical care, the Schaibles face five to ten years in prison for the probation violation. In addition to murder, Herbert and Catherine Schaible are both charged with involuntary manslaughter, conspiracy and endangering the welfare of a child. If convicted, they could face seven to 14 years in prison or more. In a handful of cases, the parents later watch a second child die.